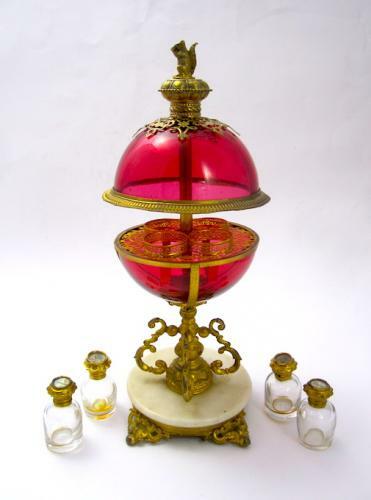 Antique French Palais Royal Ruby Red Spherical Perfume Casket with 4 Perfume Bottles Mounted with Fine Dore Bronze . The Sphere is Topped with a Dore Bronze Squirrel. The Interior Reveals 4 Perfume Bottles with Stoppers Depicting Miniatures of Paris. This Perfume Casket Rests on a Dore Bronze and Marble Base with Four Curved Feet. The Leaver Opens and Closes This Stunning Large Perfume Casket.